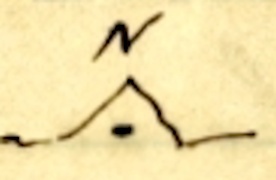 In his last entry of 1894, on December 2nd, Alfred mentions he will be leaving for “La California” (down south) on the 4th – presumably travelling by train. Alfred’s first 20 or so entries for 1895 are in list form, beginning on March 18. He travels to Rosario, Reconquista, Calchaquí, Pajaro Blanco, & Corralitos – most entries are related to an unspecified legal matter requiring witnesses. In Reconquista he meets with Lorenzo & Elisa Güller, on unspecified business; Elisa was Frank Benitz’s widow. Alfred returns to “Los Palmares” on March 30. On April 18 the writing style changes, it is smoother and slanted. We label it as Author: Alfred, slanted hand-writing for it is almost certainly Alfred attemping to improve his handwriting – a couple of months later the two styles swap and mix in the same entry for a single day. Los Palmares: On 3 April, 1895, Alfred met with Gillingham (Santa Fé Land Co. manager at San Cristóbal, SFé) to extend the rental contract of 1892; he also agreed to wait about buying the land (8 leagues, 20,000 hectares). He eventually bought it in 1904. Management: When Alfred returned from his travels in 1894, Miguel Fraire likely continued in his role as mayordomo at Los Palmares, with Elias Ledesma second, as capataz. Pajaro Blanco: Though Alfred does not explicitly say so, it is apparent from his daybook entries that beginning in about June, 1894, he had cattle, probably on shares, on a camp belonging to or managed by Hope. Alfred calls it Pajaro Blanco, place-names he mentions puts it east of the Aº El Toba & about 30km. north of Alejandra (about 20km. SW of Malabrigo, today: Romang). See July, 1894, July 1895, & November, 1895. 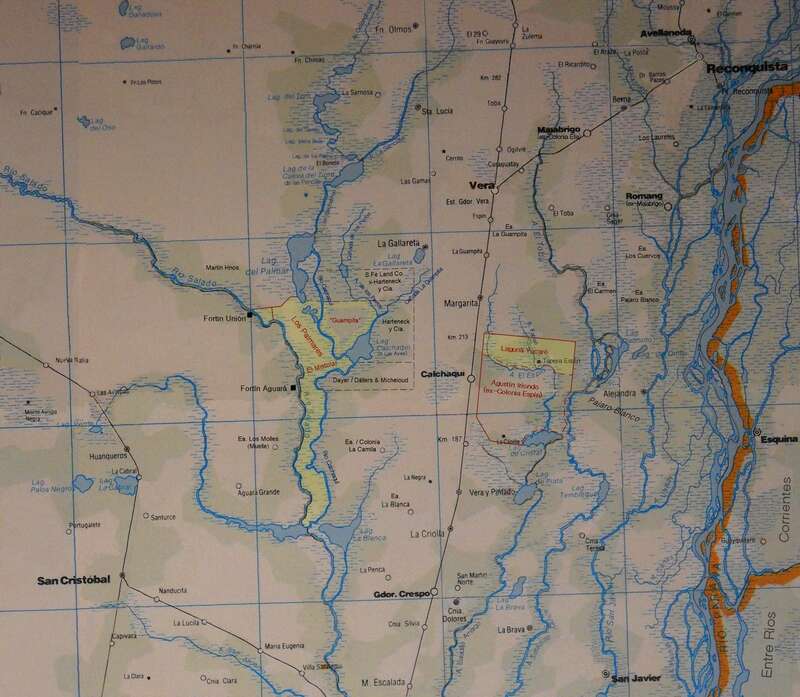 Guampita: On August 31, 1895, Alfred signed a contract to rent 3 leagues (7,500 hectares) from Harteneck y Cia., at $2,000 per year for 5 years; almost certainly the area north of the Laguna Calchaquí and east of the Rio Calchaquí - see map. August 30: From Los Palmares, 300 old cows..
November 20: Bought 766 steers from Hope at Pajaro Blanco; 400 at $8/head and 366 exchanged for 45 young bulls from Los Palmares. December 1: From Los Palmares, 1,029 steers. During September, a band of 7 indians stole 39 horses & mules from Los Palmares. Alfred, neighbor Casimiro Gay, & 8 peones pursued the indianss 150-200 km. into the far north of Santa Fé province. Following a counter raid upon the indians and an ensuing fight he was able to recover fewer than half of those stolen. Written in English by Alfred, the day-book is full of Spanglish terms as well as many other terms unfamiliar to us today. To assist with names (people & places), maps, measures, currencies, and Spanglish terminology, we have created a set of Reference pages. The reference pages open in a separate tab / window making them available in parallel to the diary (i.e. this window). Left home on 18th of March. 20th left Rosario for Santa Fé with Mr Marty; met Mr and Young Ricketts, Richards etc. 21st went to Reconquista.– With Marty. 25 " Pajaro blanco with tropilla & Patricio. 26. At Hopes. Saw juez, also went to George Spence. 27 " " & down at Corralitos. 28 " " & the juzgado with witnesses. Apr. 3 To San Cristobal.
" 5. Came back as far as Muelle, met Robson & Weinberg. & another peon. [inserted above:] began marking colt & cerdearing mares. 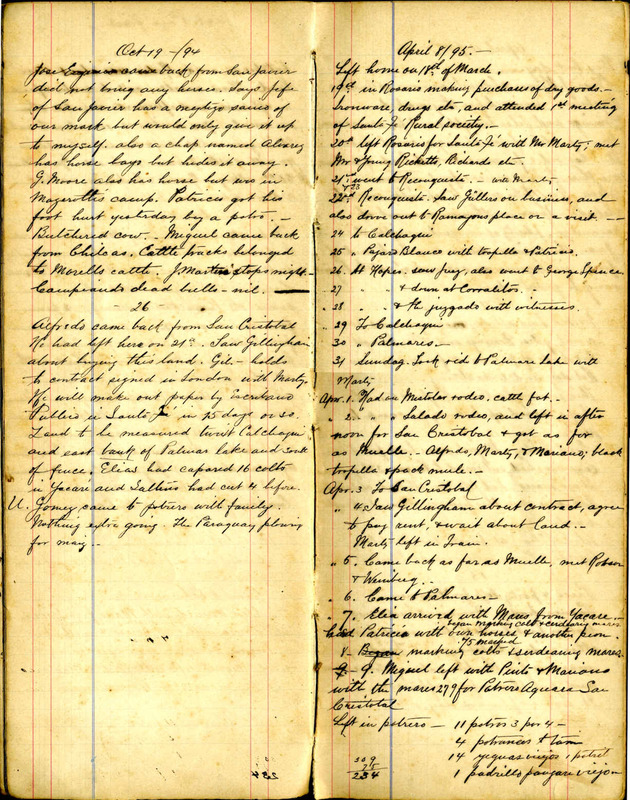 8.– Began marking colts & serdearing mares. [inserted above:] 75 marked. Elias, J.Hijinio & Eduarte were over at Antonio Michelos to revisar before they marked. Domingo and Pilar brought wood for marcacion. Gave up the idea of finishing a corral near Mistolar rodeo for marcacion. 16 loads of palms are there. Fixing marcos for tronqueros. Seca. Gave Feliz orders to repuntar cattle to Salado.– Horses are thin on account of savandija. plenty of mosquitos nights still.– Juan the paisano moves rancho to end of fence in laguna [the field] on account of cattle beginning to go outside. Worked hard all day making marcos for corral gates. Domingo and Pilar brought two loads of fire wood for marcacion. Hot day and looks stormy. This evening Mr Price, Hughes & two other chaps turned up looking for camp to rent. Good Friday. Miguel came back from Potrero Aguara; had entregared to Vargas 276 yeguaizo abajo marco. Had left 3 on other side of Salado. Had nice rain this forenoon. Cleared up afterwards. Velorio (Elias) at puesto Paso Mistolar. Began marcacion. Locked in Palmar 3000 rodeo 3000 head and finished marking by 2 o’clock 696 calves.– Rodeo not very large.– Pretty good lock in. About 24 outsiders day peones worked. Casimiro Gay and Juan Martin were here. Robson left. Weinberg here. & Casimiro Gay. Domingo Ledesma took his wife to Calchaqui & brings out mail tomorrow. Very warm day with north wind. Bro’t load of fire wood from other side. Old Pacheco was here looking for a job at corral making or fencing. Had wet cold drizzly weather the last 3 days. Met Don Agustín Irionda in Calchaqui. Had just entregared his estancia to Aleman 24000 odd cattle. Also met General Obligado. Miguel had just come back from La Camela where he had gone to ask rodeo.– Nothing going on here on a/c of bad weather.– Calchaqui full of suebracho which can’t be exported on a/c of want of wagons. Also marked 20 tambera calves of puesto Felix. Marked in potrero 130 cureros and 27 tamberas.— (5 of Elias. Making marked so far 3493. Fine weather. Peicho came. Alfred & Robson recorrered down Calchaqui to select place for Peichos puesto. Fixed well. Peicho began making puesto frente [faced by] dos Palmitas. Repuntaring the puesto cattle to Salado.– Alfredo recorrered other side of Calchaqui in front of Palmar. Mail came tonight. Finished cutting alfalfa. Ortiz harrowing.– Juan Gomez moved to end of fence Palmar Lake. Warm day. Had a little shower about day break. which prevented plowing this forenoon. exe Nothing particular going on. Fixing up grind stone. .
Sunday. Foggy morning beautiful spring day.– . Butchered old cow from potrero.– Warm day. Foggy again.– . Miguel and the apartadores came back from La Camila and Media Luna. Parted animales. Wenceslao the indian also came from San Martin at last. Hauled two loads (200) of tejas from Palmar to reroof house. Cleaned out well. Sent to puesto to take Tijeras off old galpon to fix this house with. Porteño chaps at paso Salado trying to pass over their cattle to go up to Martin’s. Gave meat to Porteño chaps. Porteños hard at work skinning their cattle near paso. Frakes here. Gomez left potrero. He goes to Aleman estancia as Capataz.– Sent boy with him to bring back cart. Martin was here. Frakes went to Calchaqui. Alfredo left for Muelle. Musky day. Working on house: finished techaring one room. Butchered cow (old). North wind – Cold morning. Frakes passed on way from Calchaqui. Finished roof of house and mudded inside a bit. Sunday.– Put on rodeo in potrero and parted 15 tambera novillos to tame and palenquiared 4 this afternoon. Alfred was over at Frake’s Martin’s. Muggy morning but warm evening.– Elia left with two peones to help Zalazar build corral at his puesto at Paso. Elias horse turned up from puesto paso with recado. Sent cart to Calcaqui to get fixed. Frost (3°) this morning. Fine day, wind changed to N.W. Carts bro’t two loads of posts from Palmar.– A. recorrered Palmar, lost the 4 terriers.– Muggy day. Sunday. Cart came back from being fixed at Calchaqui. Elia & peon turned up from Zalazars where they had been making corral. Drizzly buboso [dudoso (doubtful) ?] rain. Carts did not make a trip today. Cleaned the plants off the guacho patatas to plow them out. Don José …….. turned up and stops the night. Warm day & looks like more rain. Fine weather for camp.— Butchered cow. Carts 3 made trip to Palmar. A. recorrered monte other side of Calchaqui.– Butchered cow. Damp weather. Carts not working. A. came back from Calchaqui, had gone with J. Martin on 16th Rained slowly last 3 days.— roads very wet. Carts made 1 trip to Palmar and one to puesto rodeo. Butchered yesterday. 1st real hard frost & cold south wind all day. J. Gomez left for Calchaqui mail & cart. Another hard frost. North wind. Miguel came back. [inserted above next:] 2 carts made trip with palmas. [end] Marked 14 tambera calves at Baldomeros and 2 colts at same place. Robson turned up. Sunday. Fine warm day, plenty of mosquitos. Nothing going on. J. Martin stops night on way to Calchaqui. Wind changed to south. coldish.– Parted out 13 animals from Lucero rodeo. 3 carts made trip to south corral. Want to leave for Pajaro Blanco tomorrow but can’t find tropillo of oscuras. Butchered. Had left on the 2nd for Alejandra and came back this evening. had a very nice time at Hopes and on the evening of the 5th had a fiesta at the school. Had met Mr Marty in Calchaqui & went together. Saw the Pajaro Blanco estancia rodeo also the one rodeo loma north side of cañada Chancho. Has big novillos. Mr Hope wants to sell 800 novillos @ 8.00 gold parted up to end November.– Of which novillos to be deducted the ones to be traded for the toritos. Came back by the Carmen & Marguerto. Ramon arrived yesterday with the 35 toritos left 1 at . Gave one to man at Monte de los Ejes for looking after them, and there are still 6 at La Paraira, in two places. Toritos are pretty poor. Was 7 days on road. Yesterday and today had hard frost. Butchered on the 5th. Dried the leaves of the ombus at last. Received 500 from Mr Marty. Not hauling palmas from Palmar. Bro’t 15 more novillos to break in from potrero. 3 carts made a trip & brought leña. Ortiz working in garden. Another frost. Hard frost. 1 cart went to Baldomero to bring hides, & 1 cart to take paja to puesto Felix. Butchered cow. Had on rodeo in potrero and parted out 127 animals to camp, as potrero is overstocked. Another hard frost. Butchered old cow. Sunday. No frost. Miguel left for Calchaqui to bring maiz. Carts go tomorrow. Antonio Moreiro came.– J. Martin was here, & brought his cart, which we send in with ours. Elias with Patricio and Juan Gomez left for La Camila to part before they move their cattle away. A. recorrered monte.– One of the young bullocks died estropeado. Ortiz harrowing & cleaning up maiz stalks. Robson, Lumsdaine, Doddington, & Verstryne turned up and we had a paseo up to Palmar but mosquitos fearful bad. Visitors left again for Molle. Elias came back from La Camilla, parted 6 calves out & no big animals which seems very strange.– Miguel also came back from Calchaqui, reports having bought 300a [arroba] maiz @ 63 c with bag.– Tropilla of morros lost since 17th. Camp full of mosquito & hard north wind blowing. Butchered cow. Carts turned up this evening from Calchaqui bringing 3000 K maiz, 1 bag flour, 2 box soap, sugar etc. and also Martin’s things. Ortiz cleaning chakra of maiz stalks. Alfredo recorrered as far as Wampita Gimenez. Miguel recorrered as far North as last Palmar. Elias also recorrered. Morros still missing. First manga of locust passed north ward. South wind tonight after 6 days N wind. Cloudy weather. Cut some orkones at puesto.– Huntaring maiz stalks in chacra. Butchered cow. Noticias that tropilla of redomones & some mares had gone towards Calchaqui. Cart left for Calchaqui to bring out the 6 bags of maiz from Reconquista & Johnnies things if he turns up.– Rained some last night & is quite warm & cloudy. Guess will have lots of rain. Nothing going on. Recorrered the 4 south puestos. Nothing new report. Cabal’s cattle have all taken to the monte last week during the north winds.– Cloudy cool day.– Butchered cow. Bro’t 5 orkones from monte. Put on Palmar rodeo about 4000 head, and parted about 100 old and ugly cows to send south. Afterwards drove cattle to Salado. Cattle look very well, about dozen small calves. Antonio Moreiro, capataz Antonio Pinto & comp. Mariano, Eduarte, Rojilio, Patricio, & Agustin worked on their own horses. Butchered old cow Sent Juan Gomez to Vera to take out guia. Juan reported tacks of 5 indians, 2 on horseback & 3 on foot seen by Santos, Barra laguna coming this way.— Sent Juan to track them up Santos Muggy morning but clear afternoon. Bro’t two loads if tiles from Palmar 1 . Sent Julio Benites with cart to Calchaqui.– Splendid day. Don Juan Gomez came last night from Vera with guia which cost 1.00 gastos $9.50. Juntared horses in camp.– Awaited J. & Bischoff who did not turn up. Harder, A. Harteneck & C. Rohr turned up & stop the night. rather knocked up by heat.– Hot day N.E. wind. Getting ready to go outside tomorrow. Hot day & looks rainy again. Robson, Lamsdaine, & Verschrym also camped at Estero Las Tejas with us for two days. Sunday. Parted out Elias cattle from potrero & take them to Felix puesto — about 37 head. Warm day & looks rainy. Miguel, Elias, Checho, Julian, J. Gomez & Wenceslado left to part at Medio Luna. A slight frost this morning but N.E. wind again & warmish. Nothing going. East wind. J. Hijinio came back from Malabrigo. Sunday.– Beastly cold cloudy day and looks as if it would rain any moment. Marked 29 calves in corral & capared about 22 bulls mostly agenos. Indians stole the horses at Ewaldinos puesto at Palmar including 3 from the soga there (1 redomon from estancia) about horses Ewaldino & Juan followed up immediately.– Cool nice day.– Tonight late boy from puesto Felix came with noticia that Indians had taken 23 horses from there. Gathered horses together to follow indians up but rain came on and rained about 4 hours after breakfast.— Poor old macho stolen too, & mula gateado & 2 other mules from puesto. Weather permitting Alfred follows up with Casimiro Gay, Elias, Wenceslado, J. Hijinio & Checho, & Ewaldino & Juan if they turn up; from following the indians yesterday. Tropilla of ruanos left at puesto that is all. Left to follow up the indians who had stolen 14 estancia horses & 3 mules from & 5 mares from puesto Felix and 4 & 2 mules estancia horses from Ewaldino puesto besides 8 of his Ewaldinos. horses & mares rXxo on Sunday Euvalden & 8 39 night 1 September. Alfred, Casimiro Gay, Elia Ledesma, Jose Hijinio, Wenceslao, Eustacio, Ewaldino & Juan. Indians it seems had cut fence and cut NNW. Evaldino & Juan had followed up about 3 leagues north of the Isletas yesterday & had seen the direction they had taken. Say that 7 indians had gone with the robo.– In all we take 28 horses counting C. Gays 3. Left home at 8.30 A.M. & at noon encamped at Estero Las Tejas and at night sleep near point of monte south of Cueva del Tigre. Weather N.E. wind cloudy & threatening but cool. 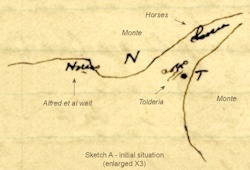 To follow Alfred's trail, see map on the north Santa Fé names page. He went north, past Laguna “Cueva del Tigre”, former Fortín “Las Chilcas” (60 km NW of Vera), former Fortín “Charrua” (15 km. west of “Las Chilcas”), “monte Golondrinas” (west of the train station Golondrinas?, 110 km north of Vera), “laguna loco” (Laguna La Loca, 80 km. north of Vera), Laguna “Palo Pelado” (60 km. north of Vera). He provides distances in: leagues = 5 km. / 3 miles, and squares / sq = 150 metres / yards . 15 " " " "
17 " " South "
Thursday.– Left camp at 6.15 A.M. and reached Isleta Largo 11.30 a.m. Morell saw us camped there & thought we were indians, and cleared to the house. Reached Chilcas at sundown and camped at house. Morell turned up later in night having followed us up with a peon thinking we were indians. Morell complains greatly of peste etc. only has 2 peons, but treated us very well. Weather cloudy & threatening but fine day on whole. Friday. Drizzly forenoon so encamped all day. Morell treated us very well & butchered cow for our benefit. Sunday. Left camp Charrua at 6.30 a.m. and marched N.N.W. about 3 leagues & struck the track of the robo & then northerly 3 leagues more & then unsaddled close not far from 1st isletas, but no water for horses. Lost watch near Charrua. Indians had passed night here at the Isletas. Marched about 3 leagues in evening until way in dark to an big isleta course N.W.– Camp after leaving Charrua for about 1½ leagues very good & then a tremendous big tacurusal & espartilla until near 1st Isletas & then some good camp, and then another big tacurusal to where we sleep. No water all day nor tonight. Slight frost this morning warm day. Left again at about 4.30 P.M. marched about 1 league N.E. & then suddenly the tracks struck almost west which we followed about 2 more leagues. Come to the first montes at sun down. After leaving water hole xxin afternoon, camps got very good especially towards the monte. One old rastrillado of cattle go N.E. from water hole, & the fresher tracks go with the horse trail. Sleep again with no water & do not make fire for night. Slight frost in morning. Wednesday. Close to camp found trail again & about 10 sq where we encamped westward found splendid wal estero with water & the first tolderias, which had evidently been deserted when the robo arrived about on the 5th. At the estero were the overo & cohudito gateado and yegua saina . Toldos (24) in two or three different places close too. A cow (Morells) & 3 calves passed the estero (close to which we had unsaddled), and we butchered a calf. In camp cut thro monte about ¾ league northward and then direct westward about ½ league & encamped for night at another estero.– In rinconado of monte. Indians had been there in toldos about on the 6th when it had drizzled. Stand guard tonight. Camp very good, strips of Quebrachales, but no very tick Quebracho. Saw different kind of Quebracho with longer leaves & denser. Elia & Ewaldino went on foot last night to spy out the tolderia, no fires, but could them talking & laughing & could hear the dogs bark from where we were incamped. About 3 oclock we saddled up, leaving our spare horses maneared & the cargero saddled and went to get around the tolderia to gather the horses etc. [Sketch, at right] Noon had just got up. We had got passed the toldos all right & saw the horses when we suddenly saw an indian among them, he asked Ewaldino who were, and not receiving an answer cleared a garhorse back, giving 3 hoots we immediately chased and shot him as he was getting into monte on foot. We immediately gathered all the horses we could see and charged down towards the toderia full speed; right in front of the toldos there was a rodeo of about 50 head of cattle which we drove out with the horses. When we got right in front of the toldos they fired about 10 shots at us.– This was before day break. We left the cows when we got some distance from the toldos & hurried the horses (19) towards ours & huntared them all right. Elia, Alfred, Casimiro & Juan then went back to the toldos to see whether any cattle left but there were none, they had already come out & marched south ward in open camp.– An indian was driving a band of about 15 horses towards the toldos & the indians fired and yelled at us.– So we went back & went to a water hole about a league to the west in edge of monte to get water in bags and to give horses water before proceeding any further. Just as we got to the water hole the indians came on us and nearly surrounded us, so we retreated southward to open camp. When we got about 1000 mts away from monte in tacurusal they came at us full lick with their piercing yells & nearly surrounded us on 3 sides, firing at us, 6 or 8 of them would get off in tacurusal & gatear us within a couple of hundred yards & fire at us. Seem very good shots. One of the first shots killed wounded pangare horse & also tostadito Elia was riding, when they would get too close we would retreat. 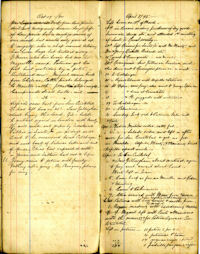 One indian was wounded in beginning, & was taken off by two companions.– When Elias horse was hit they all got together & then after a bit about 28 of them came at us full lick just like to have hand to hand fight.— When about a square off one who came on ahead was shot which considerably cooled the ardour of the rest whose cartriges also seemed to run short, as they had shot at least 200 shots.– Indians seemed to have clothes & hats like cristianos but all their shouting was done in their own language.– We marched on & the indians stopped behind, the question now was water as the only water was in the monte where the indians were and it was out of the question to go back. So we continued to march southerly until we got about 5 [overwritten by 4 ??] leagues from the toldos & then doubled to the east crossing the southern part of the Palmar. The day was very hot and a very strong north wind was blowing. In afternoon the two horses of J. Hijinio mount were left behind tired, an alasan & oscurita (redomones ) Evening came on and we were all suffering considerable from thirst, but on we marched slowing. About 9 oclock P.M. we struck a low place & dug with our knives, & at a distance of about 4 ft struck water, but very salt but which considerably revived us. filled the water bag & on we marched again bearing east by a little north.– Juan G had here parted out to find water & did not turn up again. Elia also got separated and did not turn up again. Sunday. Fearful march all last.night The salt water we drank gave us fearful diarreheo, and did not quench our thirst & every few minutes had to go the bag. Towards morning the bag gave out and our thirst was bad; about sun up we sighted a montecito ahead of us but it looked very dry sort of place; not even caraguatas. To help oter quench the thirst we eat cactus plants, but thank goodness we found an esterito of beautiful water by the side of an old corral de rama in the monte. Didn’t we drink though! I had thought sure we would all die of thirst, as Ewaldino thought the coast of monte of the Golondrinas a long way off yet.– Elia nor Juan had not turned up, but at noon Elias horse turned up, & Ewaldino & Eustacio went to look for him. But at about 3 o‘clock he turned up on foot very bad with thirst. He had unsaddled on edge of Montecito & turned his tired horse loose. There were some fires about, and in afternoon reconoitered north side of monte which was only about ¾ of a league long. Calculated that we had marched about 6 leagues to the eastward from yesterday afternoon. It was a very hot day. Juan not turned up yet.– We had been in saddle about 28 hours so were considerably tired. The toruno carguero behaved very well. He also was under saddle 28 hours. Ewaldino seems much afraid the indians would follow us up. Shot a venado & caught some mulitas & peludos. The Palmares that we passed & the camp this side simply swarmed with mulitas & peludos. Juan turned up this morning early among the horses greatly to our alarm at first as we thought he was an indian. Thank goodness we are all alive any how.– He had found water in camp. Reports lots of tiger tracks in this monte. Great alarm on account of fire seen on our tracks so we immediately saddled up & after filling our water bags marched about a league east in open camp to a small isletita or few trees, an algarraba had mark with nails . we suddenly saw a fire close N E from us, so we struck SSE & marched about 2 leagues in open camp or banado to an isleta. It was drizzly. After cooking we marched another league in the dark in same direction and struck the costa monte (algarrobal) Must be the montes of costa Golondrina, as the camp is very low.– No water for horses & we camp in a very poor place. 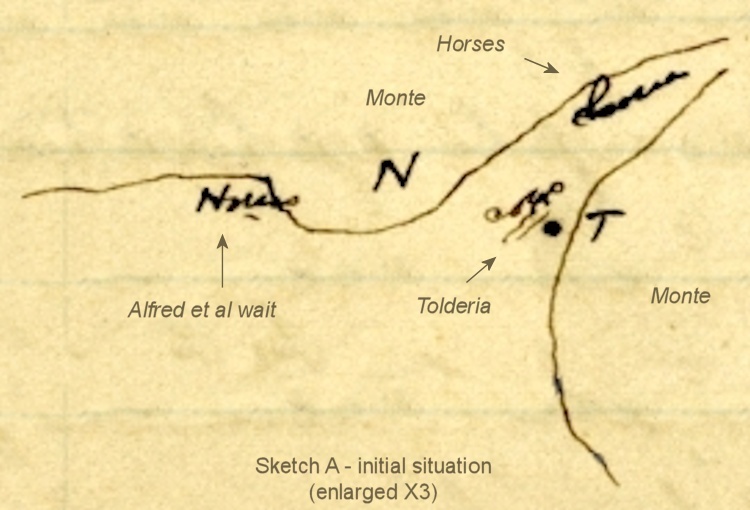 Horses giving out rapidly.– In morning early it was hot but afterwards tormento came up, & slightly drizzled rest of day.– Ewaldino says isletita with mark is only about 6 leagues from a station on railroad. Wednesday. Camped all day & dried Pilchas, but the gente are in a great hurry to move as afraid indians had followed us up.– Juan & Wenceslao killed big macho ciervo at camp. About 10 squares from here at point of monte is a big corral de rama, 1 of palo de pico & a small one de rama, & lots of old cattle tracks.– Ewandino shot guasuncho. Report the place teeming with ciervo.– Weather not settled yet. Marched southerly about 1¼ leagues to the N.W side of Isleta grande. Bañada fearful heavy to march in.– Nearly all the horses getting tired.– Camped here for rest of day. Shot Crossed a trail of roba of about 14 horses which was going N.W towards Laguna de las Vivoras.– A killed big ciervo at camp. In afternoon went out on foot & killed another guasuncho. Good hunting place.– Must have seen at least 20 ciervo in last 3 days.— Elias shot gama. Friday. Marched in two marches along west side of Isleta to extreme southern point. Camp fearful heavy & full of water. Fine grass here, where we sleep (bañado) Weather warm & cloudy & looks like we would have more rain.– Juan found 34 [24 ??] ostrich eggs. Casimiro shot 8 flamencos & we had a feast in night 2 pucheros! Juan & Ewaldino did not turn up— it seems they had been chasing baguales. Hot day & north. Yerba finished after being on sort allowance for a few days. Left azulejo of rosado tropilla behind tired. Sept 24 – Arrived at Chilcas at 9 A.M. Found that Morell had also left on expedition after indians on the 12th as the indians on the night of the 7th had stolen about 260 head of cattle. 9 went together and had hoped to catch up with us.– Had good feed & plenty of mate at Chilcas.– In afternoon two potrillos saino & mala cara turned up, & after a deal of chasing Ewaldino & Wenceslao corralled them. Fearful north wind. All day at Chilcas resting horses. J. Hijinio went with peon Don Pedro & brot azulejo left tired closer towards Chilcas. Peon here reports plenty of rain at Palamres. Had tormenta last night but very little rain & fine cool morning for marching.– In afternoon marched to about 1 league south of paso Cueva del Tigre & encamped costa monte. Reached home at about noon. Found had rained very heavily here on the 16th& the esteros all full of water. Indians had been in camp here several times. Had taken a picaso indiano, and left 3 which had stolen before.– Reached home with 42 horses etc. had left with 28. La 4 of our horses were left behind in the Chaco tired and 2 shot, and azulejo at Chilcas.– Distributed indian horses among companions.– Glad to get home again.– Had received 91 yeguarizas from La California on the 6th. Moreiro bro’t them of them 8 mares leaving 73 horses, also 3 stallions for the manadas. Troop of cattle old cows arrived at La California 19 days marchxd. Entregared at La California 282 cows, hides sold and cows left behind. Sykes & young Watt turned up in afternoon from down south. Tuesday.– Last week had in the 3 rodeos Monday & Tues & Wed & marked all the big orechano calves and capared all the bulls not padres. Friday & Sat, Miguel & gente parted out at Laguna del Perro and Gimenez an 106 animals. Report gauchos having stolen 40 head of head of cattle at Laguna del Perro on the 24th Carts went to Calchaqui on Thursday & returned yesterday, going by way of Gimenez, on a/c of arroyo crecida & bro’t out stores & machine for cutting alfa. Alfred also went on Thursday and returned yesterday. Arreg. Repettos a/c (sent for giro) also signed contract of rent of Guampita camp. From Sept 1.– This morning Elias, Miguel, J. Gomez, Wenceslao, Chicho, Eduarte, Rubio, & Caro Atado went to part at the Barra & Medio Luna. Watt went to Robson till tomorrow. Nothing extra going on. Bomboma plowing.– Alfred recorrered camp morning and afternoon. Mrs. Frakes here for tea. J. Martin here for breakfast. Watt came back from Mueller. North East wind fine weather & few mosquitos. Splendid weather for cattle as all esteros are full. Casimiro Gay was here for breakfast to see about going on expedition after indians with Morel on 20th. Fine day (East wind). Very slight frost reported. 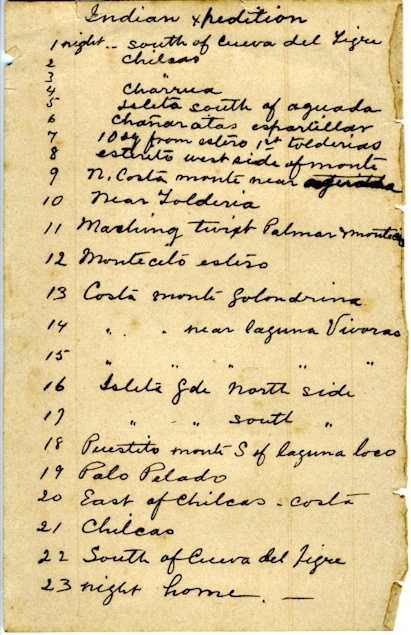 Bro’t 11 cow hides, 2 horse hides & 1 of Frakes hides from potrero.– Alfredo recorrered potrero; cattle there slow to pick up, as grass on alturos grows very slowly.– Brigide Cardoso (comisario) and two soldiers from San Cristobal turned up to take Cornelio prisoner as he had opened Aguara fence, also to take Elias dispositión about row among Varga & Lorenzo etc. Butchered a cow this afternoon. Pleasant day. Elia & peones turned up from Baldomeros puesto having finished the corral. Cardoso left taking Cornelio prisoner. Miguel turned up from home, did not bring the bulls as the freight was too high for especial train $176600 or $14.12 per head. E. Watt also turned up from his hunt from towards Laguna del Perro. Bro’t two antbear skins, 1 aguara, 3 guasuncho, 1 large pig, small cat, small pigs. Had good time. Very hot day.– N. wind. Miguel reports frost of 21st having done great damage in wheat & lino down south. Cart left for Calcchaqui with hides.– Miguel also went in afternoon. A. was at Lucero in morning. Took stray mares down to manadas. Plowing going on. Put door on back of house.— Fearful hot north wind. unsufferable. 4th as far as Calchaqui. 12 Parted out at Rodeo in front Oconnor 100 & locked in at administración. 17 Rained " " "
Had good rain last night and today was cloudy with south wind. Elia came back from Vera with guia. Parrared Mistolar rodeo today & began parting novillado for down south. Parted about 510 encluding 4 old bulls by about 1 oclock. Men on their own horses are Ramon, Manuel, Monsalvo, comp, Patricio, Rogelio, Cornelio & comp, Pinto, Augustin, Caseros & comp, Domingo. Locked in Estancia corral. Ramon Avalos & his gente parted out the yearling toritos for Hope, about 115.– Had a slight shower last night which made camp rodeo slippery.